We’d love your help. 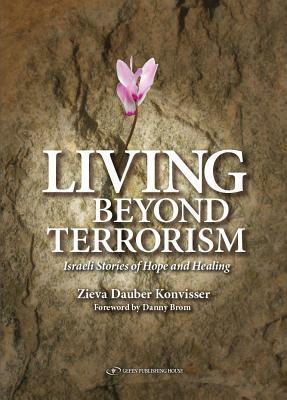 Let us know what’s wrong with this preview of Living Beyond Terrorism by Zieva Konvisser. To ask other readers questions about Living Beyond Terrorism, please sign up. The vast majority of the book is her interviewees’ stories about being the victim of terrorism and how they survived psychologically. As someone who recently experienced an excessive amount of trauma (not including a situation in Israel which was equally traumatizing), I picked up a few potential tools to put in my toolbox although I would have liked a little more. I want to warn people that this is an academic book. Specifically a dissertation adapted to reach a broader market. I like and apprec The vast majority of the book is her interviewees’ stories about being the victim of terrorism and how they survived psychologically. As someone who recently experienced an excessive amount of trauma (not including a situation in Israel which was equally traumatizing), I picked up a few potential tools to put in my toolbox although I would have liked a little more. I want to warn people that this is an academic book. Specifically a dissertation adapted to reach a broader market. I like and appreciate academic books so that does not bother me. However, not everyone does and not everyone wants to see footnotes (in pretty much all the chapters) or research methodology (Appendix A), so I wanted to put that warning out right there. However, that being said, for an academic book, it is surprisingly readable to the layperson although I still know a few ways things could be rewritten to better target an audience, but not a book I would recommend reading straight through. It is just not built for that. It also can be read easily by Gentiles as well as Jews as any Hebrew or Yiddish is either explained directly in the text or in the glossary in the back. I will be honest, I am not sure what market is being targeted. Psychologists or those who deal with PTSD and similar would probably like the book and should probably have it on their bookshelves. Survivors of traumatic experiences would appreciate the stories contained within, however likely not all at once, basically take a few stories then read the conclusion. I think it could be used as a teaching tool for classes if a professor for example wanted to take a selection of the stories and have a discussion around them. One concern I have is that in parts it comes off as just a touchy anti-muslim and I saw at least one statistic that said Muslim extremists are behind the majority of the terrorist attacks worldwide. I am not sure how accurate that is since I have seen recent statistics that said otherwise. This a solid four star book overall. The first thing that I noticed and something that kept coming up is that the book is a testament to “the strength of the human spirit” (xxiii). Another recurring thought is that of resilience. I will attempt to write this review without giving away too much of the book. There is just so much that touched me and I want to do the work justice. It is an important book and I hope it gains a wide readership. It’s a book about hope and healing, and that is for anyone. Konvisser has an wonderful writin The first thing that I noticed and something that kept coming up is that the book is a testament to “the strength of the human spirit” (xxiii). Another recurring thought is that of resilience. I will attempt to write this review without giving away too much of the book. There is just so much that touched me and I want to do the work justice. It is an important book and I hope it gains a wide readership. It’s a book about hope and healing, and that is for anyone. Konvisser wants to make it clear, by letting these people tell their own stories, that these survivors are human beings, not merely numbers we hear on the evening news. Real people with hopes, dreams, loves, worries, fears, and lives and people who love them and whom they love. She writes: “By telling and retelling their stories, we celebrate their lives as people—as human beings—not simply as players in a larger story or as numbers. By telling their stories we bear witness” (xxvii). The book is an anthology of the stories of not victims but, survivors (this is an important distinction for them) of terrorist attacks: which include shootings, car bombings, and suicide bombings. Konvisser considers this text, this work, as a tribute and a responsibility. It seems that those in this area of the globe, are experiencing something similar to the state of the United States before the Civil Rights Movement in the 1960s. Violence obviously is not working, and maybe they should try non-violence. This book could be helpful in establishing the dialogue that can bring these two groups of people closer to peace. There is a bulleted list of “Lessons Learned” in the preface, which according to the author was developed from all the stories of the survivors and of the bereaved. I won’t include it here, but recommend the reader to not skip the preface and so miss this important part of the work. It’s not just Jewish-Israelis who are the victims/survivors; the Arab people living in this area also suffer: some are killed, some maimed and many are treated like criminals just for being Arab and being in the area of a terrorist event. So, their trauma is double maybe even tripled or quadrupled. While most of the people’s stories talk about the post-traumatic stress that they suffered, they also depict post-traumatic growth. This latter, the way I understand it, would be like a kind of awakening brought on by the trauma and the recovery from it. Even in the midst of the terrible events and the subsequent recovery, most of the stories presented here show amazing amount of hope. The survivors talk about people asking why they keep living there, to which they answer, “This is my house and my family…” In a sense, “How can I leave my home?” These survivors realize what’s important: family, friends, sense of place and belonging, and not letting the terrorists win. (264) The survivors also talk about increased gratitude, along with a fear of returning to the place of the attack. (266) This realization of what’s important and gratitude are also recurring concepts in these stories. The take-home seems to be that even if we never have the misfortune of experiencing a terrorist attack, we can learn ways of thriving when we face other traumatic events, or loss. (262) Somehow, the perpetrators and retaliators have to realize that the violence is not solving their issues. It seems the terror works for a short time, but only a short time. The survivors will not let the fear win, so the terrorism loses its venom. As one survivor says, “I had a new chance, a new life, to be more or less whole” (41), and “In the beginning it has to destroy you in order for you to survive” (42). This is a book about surviving, and in many cases flourishing, even after being involved in some of the worst events a person can imagine: terrorist attack. The atrocities take their toll, but the survivors, at least those who share their stories here, come out stronger and with a great appreciation of life. I highly recommend this book to anyone interested in terrorism and dealing with it; trauma and healing after trauma; war and survival. It has given me a new perspective on my own problems, making them seem almost non-existent in comparison. However, neither Konvisser nor the story-telling survivors ever trivialize the trauma of others. They demonstrate that it is significant and people can get through it. I hope many readers find hope in this book, or at the very least, that they gain a new perspective on the world around them. the author, Zieva Konvisser, who has studied how survivors of the Shoah coped, interviews people who have been affected by terrorist attacks, in Israel, mostly from this century, but some from the 1990s. These are people from all walks of life, religious or not so religious, male or female, young or older, Muslim or Jewish, Druze or Christian, native born or immigrant. Konvisser was impressed by the resilience of people in the face of the distinct possibility of a terrorist attack and she wanted the author, Zieva Konvisser, who has studied how survivors of the Shoah coped, interviews people who have been affected by terrorist attacks, in Israel, mostly from this century, but some from the 1990s. These are people from all walks of life, religious or not so religious, male or female, young or older, Muslim or Jewish, Druze or Christian, native born or immigrant. Konvisser was impressed by the resilience of people in the face of the distinct possibility of a terrorist attack and she wanted to know more about how people survive and go on to live with the loss incurred. Also, she wanted to know how can a society learn to not engage in terrorism. How can we prevent genocide? The interviews are very poignant, even difficult to read, because of the trauma that will never be outlived. But it is very enlightening to see how people go on to live positive, productive, creative lives by choice. It isn't easy for any one, but the drive to not give into to hatred, bitterness, self-pity or revenge is remarkable to see. I had to read it in small chunks because it is so overwhelming to know that there is such a hateful driving force to commit terrorism. That aspect is not addressed in this book. These people, and sadly so many others, need to have their stories told because they are not just statistics. This is true through out history and around the world today. I think that the hatred / bitterness / resentment that drives people to be terrorists also needs to be looked at and addressed or else we will be reading these stories over and over and over again. I imagine that I will be reading this book again and recommending it to others. The stories within the pages are very inspiring, and filled with hope, despite the traumas and fears forced upon the individuals. Each person has learned to live through it, and to cope with what life handed them. The majority of the individuals have gone on to help others, either through working for humanitarian organizations, forming an organization themselves, or through volunteering to help victims of terrorism. The traumas experienced have formed their lives in ways that they never expected. The stories within the pages are very inspiring, and filled with hope, despite the traumas and fears forced upon the individuals. The traumas experienced have formed their lives in ways that they never expected. Most have realized the important things in life, and that the trivial plays no part in daily living. They are terrorist survivors, and are grateful for having lived, despite physical and emotional limitations. The individuals come from diverse backgrounds-Jewish, Muslim, Arab, Israeli, American, and children of immigrant parents. The stories are good examples of current affairs between Israelis and Palestinians. Most of the incidents occurred during and after 2001. That peace has not been attained since then, is a testament to hatred, nonacceptance and lack of understanding. The stories give one information to ponder. Thank you to Gefen Publishers for my complimentary copy.